If this blog is all about finding your WHY, then today, I have to apologize and do a 360-degree turn on the meaning of that word and ask, WHY? Priceless is right. Dave remembered. It was genius at work. I was only 17-years-old, but they are times I won’t ever forget. Because it was more than one time, it was over and over and over. 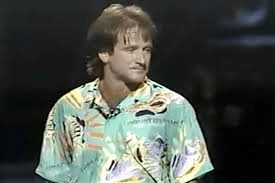 In 1982 Robin Williams did an HBO special called an Evening with Robin Williams. For me and my group of my friends, there were plenty of evenings spent watching this special I had recorded on my VHS player, it seemed nearly every weekend, watching it so many times and laughing so hard, it hurt. Robin Williams literally took our breath away with laughter, he was so crazy, so quick, so manic, so topical, so damn funny. I can’t even remember all the lines now, (well maybe some of them I’m not repeating here), but I definitely remember the way it made me feel. I knew I was watching something special. There had been no one like him, nor will there be again. Just four years earlier Williams burst onto the scene of American consciousness in a show called Happy Days. 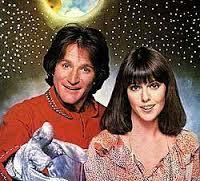 He had a guest appearance as an alien named Mork and before you knew it there was this show called Mork and Mindy, that everybody was talking about. That was of course until ABC, the network that owned the show, got greedy and in only its second season ABC moved Mork and Mindy from it’s cushy spot on Thursday nights, to a Sunday night time slot up against a juggernaut called Archie Bunker’s Place. Archie crushed them in the ratings. It was really the beginning of the end for Mork and Mindy, but in the end, it was all for the best… because Robin Williams was destined for much more than acting like a wacky alien. Stand-up comedy was his wheelhouse and he rocked the world. 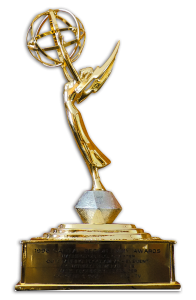 That HBO special was followed by plenty more and then of course morphing into an acting career on the big screen. The guy won an Oscar, an Emmy, Golden Globes, a Grammy, you name it. 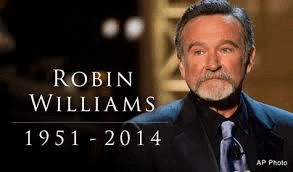 I’m not going to recount his entire career here, there are about a billion articles on the web you can read and I’m sure remember in some way how Robin Williams touched your life. 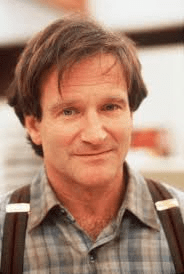 And now so many of us have found sadness in the loss of someone who brought laughter to so many. The irony of it all is how so many comedians suffer a similar fate. Behind all the laughter they give to us as their gift, they always seem to hide so much pain. Instead of facing it, they mask it, or avoid it by being funny, by making the rest of us feel good, making us smile, making us laugh until it hurts, yet they are apparently the ones in pain. The funniest people seem to harbor the greatest demons, ones they can’t escape, so they try to keep them at bay with vices like drugs and alcohol. We have seen it time after time after time. I’m not condemning it, because I don’t know their demons, it just makes me sad. All the world wants to laugh. If music is the soundtrack of our lives then laughter is its safety net. Life comes at you from all directions and if you have the ability to help others focus, at least for a while, on what it means to smile, then you must be doing something right. Robin Williams did that for me, and for countless others. The proof is in the fact that more than 30 years after I first saw his HBO special, I still remember how he made me feel. That’s saying something. That’s legendary. That’s laughter, so much so that today, it hurts. Well said Mark, I remember the HBO special and how much it made me laugh too! You Are The World: It’s Just About… Life.